Homepage Mobile Phones Motorola Samsung Galaxy Star Pro vs Micromax Canvas Fun A63: Winner is! 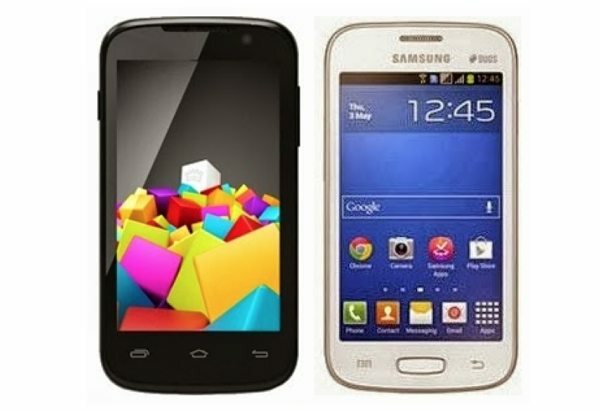 Samsung Galaxy Star Pro vs Micromax Canvas Fun A63: Winner is! Yesterday we reported the news on the Samsung Galaxy Star Pro, this is an affordable smartphone but how does it compare to the likes of the Micromax Canvas Fun A63. When it comes to the operating system the Samsung Galaxy Star Pro only runs Android 4.1 Jelly Bean, the Micromax Canvas Fun A63 is a little better thanks to running Jelly Bean 4.2. The operating system win goes to Micromax. Both the Galaxy Star Pro and Canvas Fun A63 have a 4-inch TFT capacitive touchscreen with 480 x 800 pixels, so this one is a draw. The Canvas Fun A63 wins on the processor front because it has a 1.3 Ghz MTK 6572 dual core processor; the Star Pro only has a single core 1GHz Cortex-A5 processor. You will find a 2-megapixel rear camera on both smartphones, but unlike the Galaxy Star Pro the Fun A63 has a front-facing camera for video chats. There is a 1500mAh battery on both devices, the Samsung Galaxy Star Pro wins this one because it provides 370 hours standby time and 15 hours of talk time, the Fun A63 only provides 135 hours standby and 4 hours talk time. The Canvas Fun A63 has a better and more powerful processor, so its understandable the Star Pro wins on the battery life front. The A63 comes with a 1GB internal memory for apps installation, as well as 1GB for mass storage, the Star Pro has 4GB internal memory, Both devices have microSD card slots and 512MB RAM. Only the Canvas Fun comes with 3G, the Star Pro lacks this. When it comes to the price in India the Samsung Galaxy Star Pro is priced at Rs. 6989 and the Micromax Canvas Fun A63 is around Rs. 6878. The clear winner is the Micromax Canvas Fun A63.